Hauppauge has been making affordable hardware with robust software for as long as we can remember. 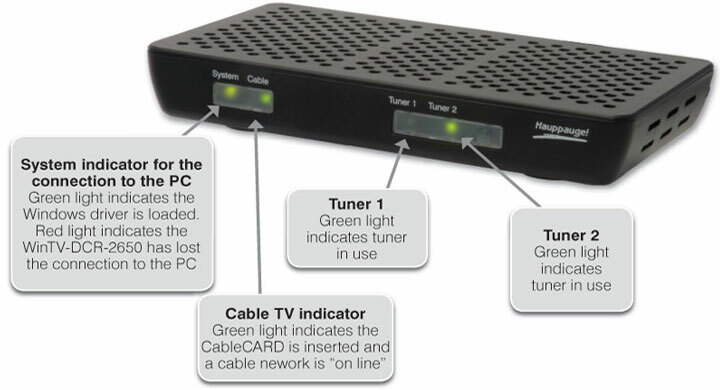 Pronounced “hop hog”, this New York-based outfit has brought a new gem to us in the form of a Dual CableCard TV tuner, dubbed WinTV DCR-2650. Hauppauge USB TV tuner should allow you to use your favorite showshifting (PVR) program to capture your favorite shows to watch at your leisure. With slots for 2 CableCards, you can record 2 programs at the same time. The WinTV connects to your PC and streams decoded video to your computer for recording. This will make a great partner to Microsoft’s well regarded and still suspiciously free Windows Media Center show guide. If you have the disk space, you can even record and save full seasons of a show at a time. In the beginning there was Tivo, and all was good. Someone seemed to be making a menu system and DVR system that was easy to use and not beset with ads. Once the cable TV companies realized they were getting cornered on their own market, they started to create ways to edge out Tivo and anyone who might try and make watching TV about the TV shows not commercials or advertisements. Set-top boxes lead to CableCards and now they are here to stay, if you want to decode premium digital TV streams that is. At $149, the Hauppauge WinTV DCR-2650 is another almost suspiciously cheap alternative to dealing with your branded CableTV TV guide. Having used multiple Hauppage devices, we know they are just great bargains. Hauppauge and other carriers should start shipping them soon.